Just outside the building that bears the name of his son stands a bronze, life-size sculpture of the late P.M. Gillmor, clasping hands with one of his young grandsons. Dedicated Saturday, June 24, as part of Alumni Weekend festivities, the P.M. Gillmor Gardens pays tribute to the man whose strong work ethic and deeply rooted family values left a legacy for family and community. Members of the Gillmor family, associates from Old Fort Bank, sculptor Don Lundstrom and community members gathered to witness the unveiling of “A Walk with Granddad” amid the brick walkway, benches and colorful perennials. “When I think of the generations of young people who will pass through these gardens, I think he would be very pleased to be remembered in this way,” he said. After his death in April 2005 at age 94, Heidelberg sought an appropriate and meaningful way to honor the many contributions P.M. Gillmor made to the community to ensure its future. Board of Trustees members Mike Kerschner, president and CEO of Old Fort Bank, and the late Fred Fabrizio, ’61, spearheaded the initiative to create the gardens, and to place it outside Gillmor Science Hall, Heidelberg’s new state-of-the-art science facility named in the congressman’s honor. The Gillmor family has long been connected to Heidelberg. Both P.M. and Paul Gillmor served as trustees; Paul’s wife, Karen, currently serves on the board. Lundstrom, the sculptor who also created the statue on the lawn of the Tiffin-Seneca Public Library, said the project became a labor of love, even though he had not personally met P.M. Gillmor. “I regret that I never knew P.M..” said Lundstrom. “It would have been a great experience to be in the presence of this man. “In a strange way, when you work on the likeness of a person not in your midst … you spend three or four months surrounded by photos and you talk with family members, in the end I really didn’t feel like a stranger to him,” Lundstrom said. The sculpture depicts P.M. Gillmor in a moment of quiet and joyful relationship with grandson Paul Michael Gillmor. Details include the likeness of a Lions Club pin, representing P.M.’s lifelong dedication to that organization and to serving the community, as well as his signature cap and a ball cap belonging to his grandson which he carries in his hand. Lundstrom, who has been creating sculpture for more than 30 years, has had his works commissioned by private collectors, libraries, colleges and businesses. 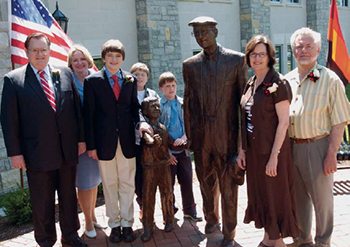 Following remarks, Gillmor family members helped unveil the statue, now visible for public viewing.